Introducing the first pre-measured cleaning tablet designed exclusively for home brewers! Pre-measured tablets take the guess work out of cleaning your home brewing equipment! Simply fill your keg or carboy with hot water, add the tablets, and let them go to work. 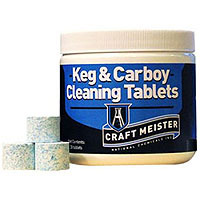 Keg and Carboy Cleaning Tablets are a mix of powerful alkaline and oxygen cleaners, providing a one-two punch to knock out soils and build-up. Directions: Carboy Cleaning: Fill Carboy with HOT water. Add 2 tablets per 3 gallons water. For heavy soils, use 1 extra tablet per carboy. Soak for at least 60 minutes. Rinse thoroughly, then sanitize. Keg Cleaning: Fill keg with HOT water. Add 1 tablet per 3 gallons water. Soak for at least 60 minutes. Rinse thoroughly, then sanitize. Comments: I love these! I used them to clean one of my ferment buckets and I also threw in my immersion chiller. It came out looking nearly brand new after about a half hour.